Like your boy, me, he always requests no tomatoes on all his Taco Bell items. 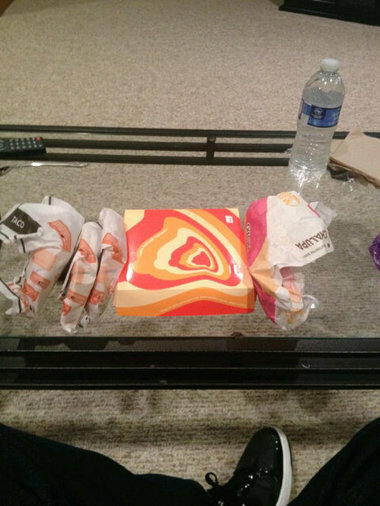 Unlike your boy, me, Justin Verlander probably never actually ends up with tomatoes on his Taco Bell items, because who would dare screw up Justin Verlander’s pre-start Taco Bell order? Saturday Night Live produces fake Taco Bell commercial: This would probably be funnier if I were familiar with the original Brad Pitt ad in question before I saw the parody version. But the Dr. Zizmor one is pretty good regardless. Is Saturday Night Live funny again? This entry was posted in Baseball, Taco Bell, Words by Ted Berg. Bookmark the permalink.